AMSOIL Oil Filters have the best efficiency rating in the industry. The Filters provide a filtering efficiency in accordance with industry standard ISO 4548-12 of 98.7 percent at 15 microns, while competitive filters containing conventional cellulose medias range from 40 to 80 percent efficiency. AMSOIL Oil Filters have significantly lower restriction than conventional cellulose media filters. Their small synthetic nanofibers trap smaller particles and hold more contaminants, resulting in lower restriction. During cold temperature warm-up periods, a lube filter allows the oil to easily flow through the filter compared to a typical cellulose filter. Lower restriction decreases engine wear. A filter’s capacity refers to the amount of contaminants it can hold and still remain effective. AMSOIL EaO Filters have a far greater capacity than competing filter lines. When used in conjunction with AMSOIL synthetic motor oils in normal service, EaO Filters are guaranteed to remain effective for 25,000 miles or one year, whichever comes first. AMSOIL Ea Oil Filters are made with premium-grade full synthetic media. 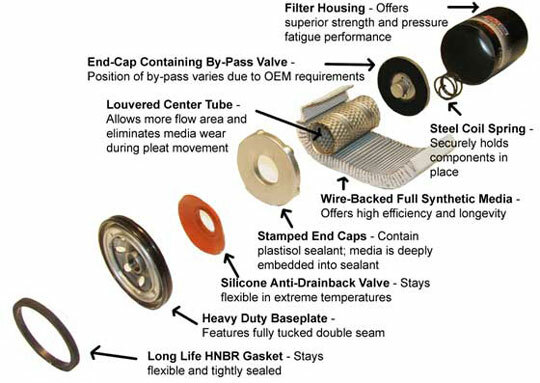 The strictly controlled processing of this media ensures accurate filter construction, and is what allows Ea Oil Filters to deliver higher capacity and efficiency along with better durability. Over the service life of a conventional cellulose filter, hot oil will degrade the resins that bind the media. The Ea Oil Filters’ full synthetic media technology is resin-free. It uses a wire screen backing that is pleated with the media for superior strength. Ea Oil Filters are constructed with HNBR nitrile gaskets that are fully tested to extreme distances in numerous severe environments. The filters also feature fully tucked seams, a molded element seal, roll-formed threads and a long-lasting premium-grade silicone anti-drain valve.